The Shah Kaman has a lineage stemming from 2 different sources. Its physical form owes much to the traditional kamanchehs of Persia and Azerbaijan, but the way it makes it’s sound comes from the tarhu (a new form of spikefiddle that I created in 1995). I first came across the kamancheh in miniature paintings from the Middle East and Central Asia, and there was an elegance in its form that I found extremely attractive. The first bowed instrument I made was a kamancheh with an almost traditional design, except that it had sympathetic strings in a channel down the middle of the neck. From 1980 onwards I experimented with the kamancheh and various other forms of spikefiddle from the East, especially the Turkish tanbur and the Chinese erhu. These instruments all used a skin top, and I was drawn to the type of sound that came from such a light-weight sounding board. There were other aspects of skin tops that I didn’t like – because of its flexibility, skin is not good at producing low notes. By 1994 I gave up trying to get the sound I wanted from a skin top, and changed to using a wooden cone instead – this weighed the same as a skin top, but was much more rigid. Using this concept I created the new instrument that I called tarhu, combining the words tanbur and erhu. In 1995 I heard a recording of the great Azerbaijani kamancheh player Habil Aliyev, which proved to be very significant for me. I listened to this recording hundreds of times over the next few years and finally in 2001 I made a kamancheh version of the tarhu. The overall design drew heavily on traditional kamancheh but inside it was pure tarhu, with a light-weight wooden cone suspended within the body. In 2002, I met Kayhan Kalhor when he and I were both performing at the Knee Fiddle Magic festival in Rudolstadt, Germany. 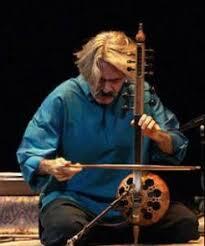 Kayhan liked the sound of the tarhu, but wanted to explore an instrument with sympathetic strings. I had already done extensive work in this field, so we decided to work together on developing a kamancheh tarhu with 5 playing strings and 7 sympathetic strings. The first version was sent to Kayhan in 2003 – some aspects of this instrument were good, but the sound needed further development. An opportunity to do this came up in 2004 when, with the help of Ross Daly, I was able to spend 3 weeks on Crete working with Habil Aliyev on the sound of the kamancheh tarhu. This was a wonderfully creative period, and there was a huge leap forward. Kayhan and I collaborated further over the next few years as I continued to develop the new form of kamancheh tarhu for him, which he eventually received in 2008. When Kayhan suggested that this form of instrument should be called Shah Kaman, it seemed to me that after a long journey we had reached a significant milestone. 4. The Making of Habil Aliyev's Kamancha Tarhu: First published www.spikefiddle.com, 2012.